6 € per family. Advance booking required. 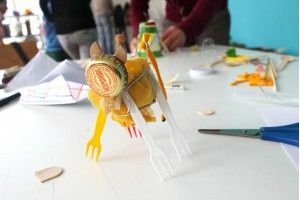 Based on the book Imagina Animals by Xosé Ballesteros and Juan Vidaure, we'll create characters using recycled materials, make up a story for each of them, and tell it in a simple audio-visual work. By Bruna Dinarès and Elisabet Wenceslao, with Assumpta Cirera-Tuti, assessor of educational content. WHO IS THE ACTIVITY AIMED AT? Adults, and children from 3 years and up. Reservations may be booked either by filling in the application form, or by calling 93 885 37 04, until the closing date, Thursday 17th November, 2016. Please note that a limited number of places are available.